Passover begins the evening of Friday, April 19, 2019 and ends the evening of Saturday, April 27, 2019. 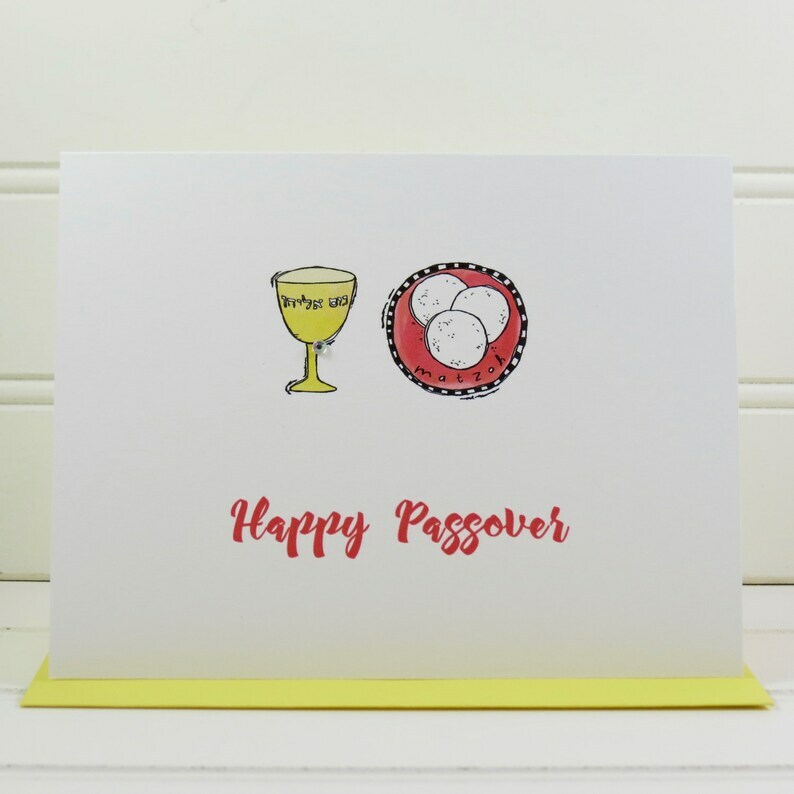 This charming card is perfect to give to someone who celebrates Passover. This card can be fully customized and personalized at no extra charge and also includes a free matching colored envelope, round envelope seal, and a U.S. Forever postage stamp. On the front of the card, there is an illustration of a wine goblet sitting next to a plate of matzah crackers. The message beneath the illustration says "Happy Passover". The card measures 4.25” x 5.5” when folded and is blank on the inside. Your handcrafted, Passover card will be individually printed in my home studio so you can further personalize it by adding any name you wish on the back of the card as shown on the photo. Provide the name(s) you want printed in the Notes section. Great quality and amazing customer service! The card makes me smile. Great Easter card, especially for a family of Star Wars nerds!! I had prompt response to my rather stupid questions. Package with cards got here in pristine condition and each card had a sticker and a US mail stamp. I am totally pleased with my purchase.